Seven players picked during the 2010 Entry Draft were chosen during the two-day Canadian Hockey League Import Draft, which finished Wednesday. With the first pick, the WHL's Prince George Cougars selected Slovakian defenseman Martin Marincin, a second-round pick of the Edmonton Oilers. The 6-foot-4, 187-pounder had 6 points in 35 games with Slovakia's Under-20 team last season. He also had 2 assists in six games for Slovakia at the 2010 World Junior Championship, and as captain of his country's entry at the World Under-18 Championship, he had 2 goals and an assist in six games. "We've had a chance to see Martin play a few times and we are confident he will be a strong addition to an emerging defense corps," Prince George General Manager Dallas Thompson said. "We had a chance to meet with Martin at the NHL Draft and found he's not only a solid player, but a great young man, as well." With the second pick, the OHL's Sarnia Sting selected Russian right wing Nail Yakupov, and the Halifax Mooseheads of the QMJHL took Czech left wing Martin Frk third. Both players won't be available until the 2012 NHL Draft. The WHL's Edmonton Oil Kings picked Czech-born defenseman Marek Hrbas fourth. Hrbas, a 5-10, 165-pound defenseman, had 15 points in 40 games with the USHL's Fargo Force last season. He's eligible for the 2011 Entry Draft. "Marek is great on the power play, he’s a good kid with good character," Oil Kings GM Bob Green said. "He's a smart, puck-moving defenseman, and we expect him to contribute to our team next season." Teams are allowed to carry two European-born import players, and the Oil Kings traded up to take Latvian-born left wing Kristians Pelss with the 19th pick. Pelss was a seventh-round pick of the Edmonton Oilers. He had 2 goals and 3 points for Latvia at the World Under-18 Championship. With the fifth pick, the OHL's Kitchener Rangers picked German right wing Tobias Rieder, who had 10 goals and 23 points in 45 games with Landshut in the German league's second division. He's eligible for the 2011 Entry Draft. German center Mirko Hoefflin, picked by the Chicago Blackhawks in the sixth round, was taken with the sixth pick by QMJHL's Quebec Remparts. 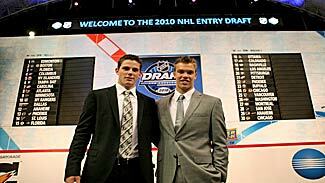 Maxim Kitsyn, NHL Central Scouting's sixth-ranked European skater for the 2010 draft and a sixth-round pick of the Los Angeles Kings, was taken by the OHL's Mississauga St. Michael's Majors with the 17th pick. Swedish defenseman Sebastian Owuya, a sixth-round pick of the Atlanta Thrashers, was selected No. 40 by the WHL's Medicine Hat Tigers. Fellow Swede Ricard Blidstrand, a seventh-round pick of the Philadelphia Flyers, went to the WHL's Regina Pats with the 46th pick. The OHL's London Knights selected Russian goalie Igor Bobkov, an Anaheim Ducks 2009 third-round pick, with the 53rd selection. He was Russia's best player at the 2010 World Junior Championship, posting three wins and a 2.45 goals-against average.